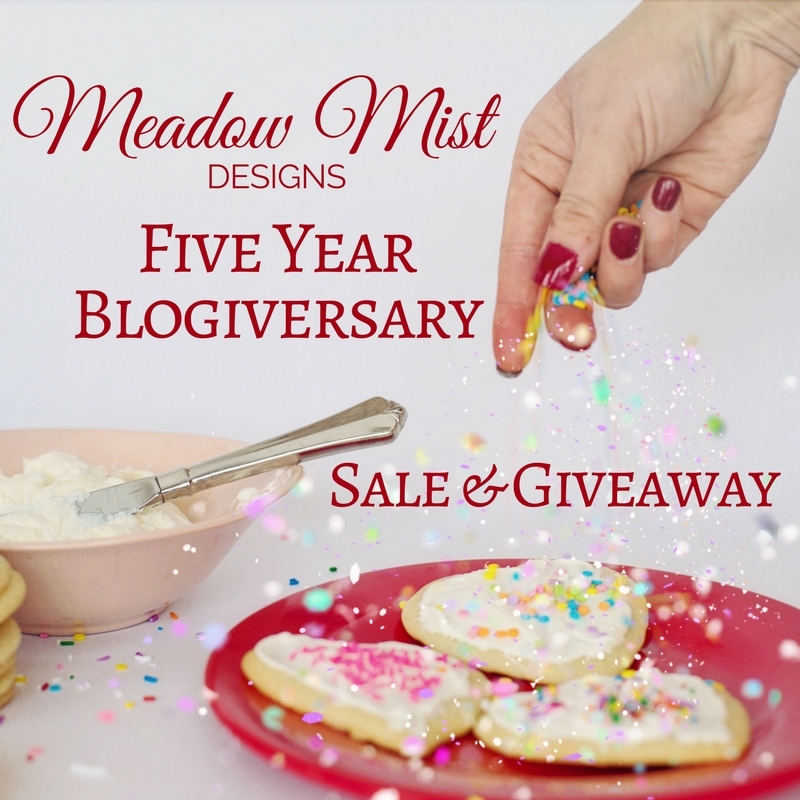 Five Year Blogiversary, Sale, and Giveaway! Five years today! I can't believe that I started this blog half a decade ago. Back in 2012 when I started this blog Flickr was one of the main ways of connecting with other quilters online, Instagram was still in its infancy (I had did not have a smart phone and had not even heard of it), and I had a toddler and a kindergartner. 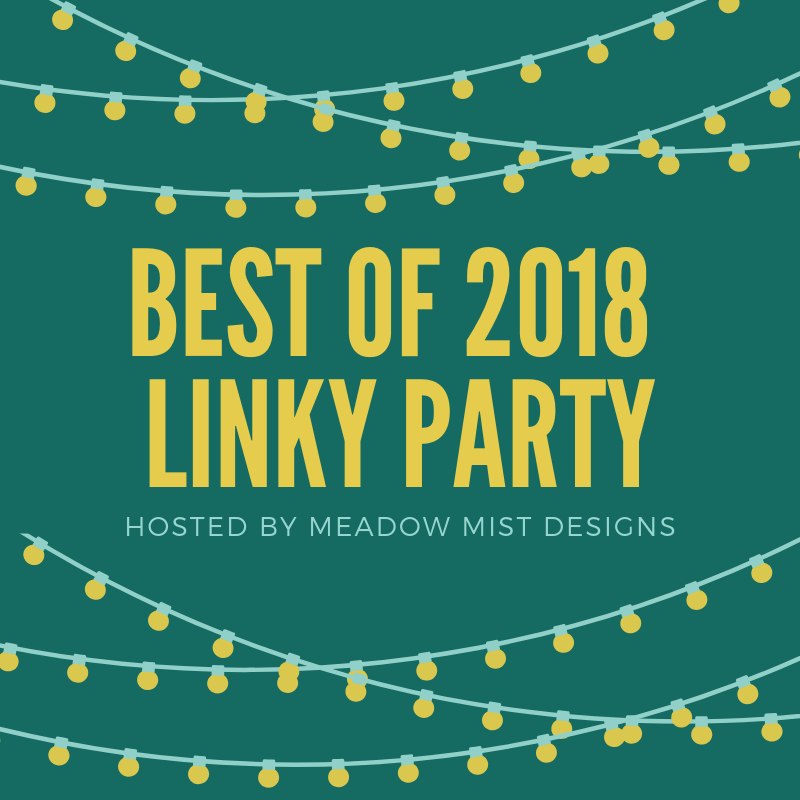 I began blogging to have more engagement in the online quilting community and to be able to take part in all of the fun linky parties that were happening around the web. Fast forward to today, I now have a 2nd and 5th grader and am approaching the big 40. I now have so many wonderful quilters that I am lucky enough to call friends. I have published just about 500 posts, have over 2 dozen free tutorials, and posted close to 100 finishes. I am now hosting my fourth annual mystery quilt and have a book coming out in February. I look forward to the next 5 years! FREE SHIPPING All printed patterns in my Etsy shop have free shipping. No coupon code needed, I have set all shipping costs to $0 for 1 week (until midnight Oct 5th). COUPON CODE Use the coupon code 5YEARS for $10 off your purchase price of $35 or more in my Etsy shop (this will work out to be similar to buying 3 patterns and getting 1 free). This coupon code will be valid until midnight Oct 5th. Want an even better discount? 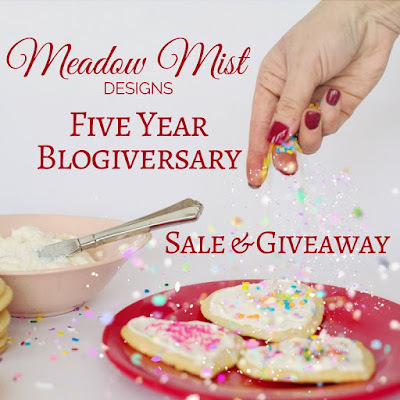 Subscribers to my Meadow Mist Designs Pattern are getting an even better special coupon code (will be sent out at 7am EST on 9/28), you can sign up here for the newsletter and the coupon code. 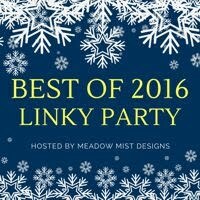 How about a giveaway to celebrate too? 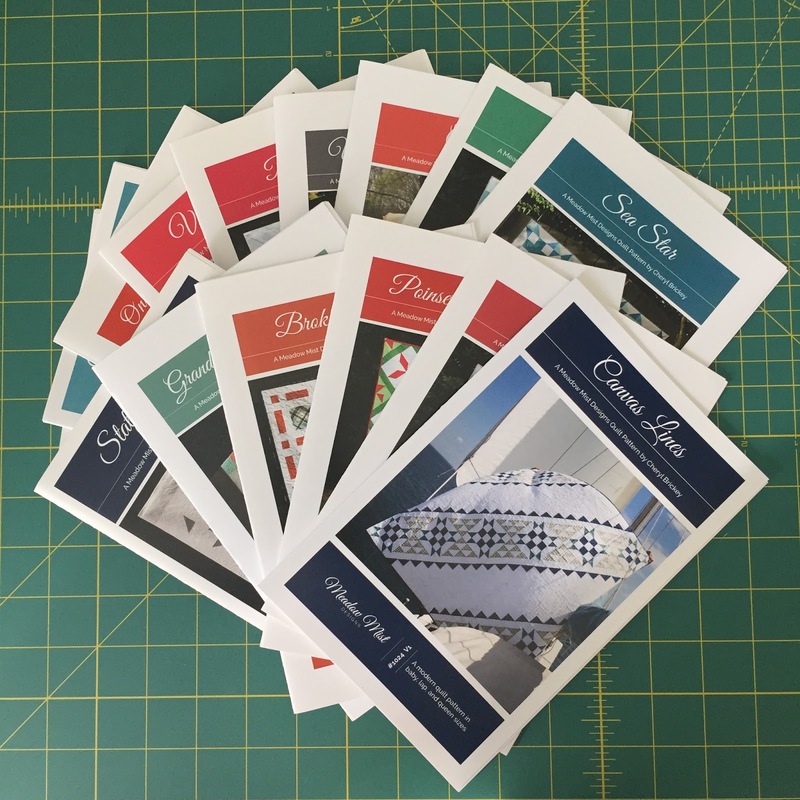 I am giving away one complete set of my printed patterns, 15 of my best selling patterns! ($150 value). The giveaway is open worldwide, but if the winner is outside the US I will substitute digital patterns due to shipping costs. To enter, simply use the rafflecopter entry below: (if you are reading this post via e-mail, you may need to click over to the blog for the rafflecopter box to appear below). To enter the giveaway, you must be a follower (new or existing) of my blog (e-mail, bloglovin, feedly, etc). For a bonus entry, you can name your favorite Meadow Mist Designs pattern. Thank you all so much for your support and friendship over the last half a decade!!! 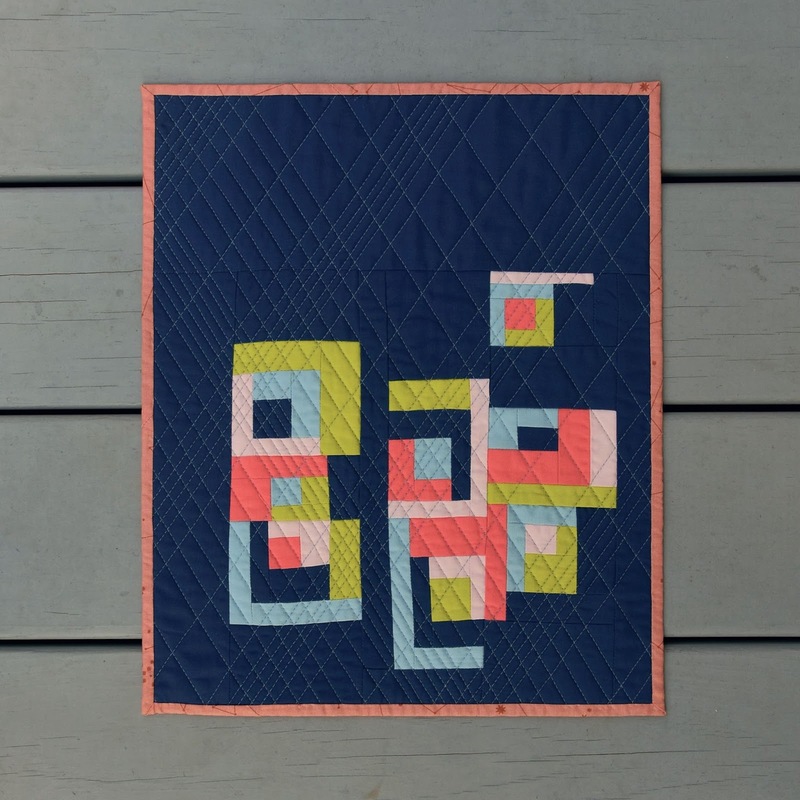 Have you seen the new quilt along that Yvonne just started over on her blog, Quilting Jetgirl? Yvonne creates amazing quilts with a transparency effect and Wayward Transparency is one of my favorites she has created. 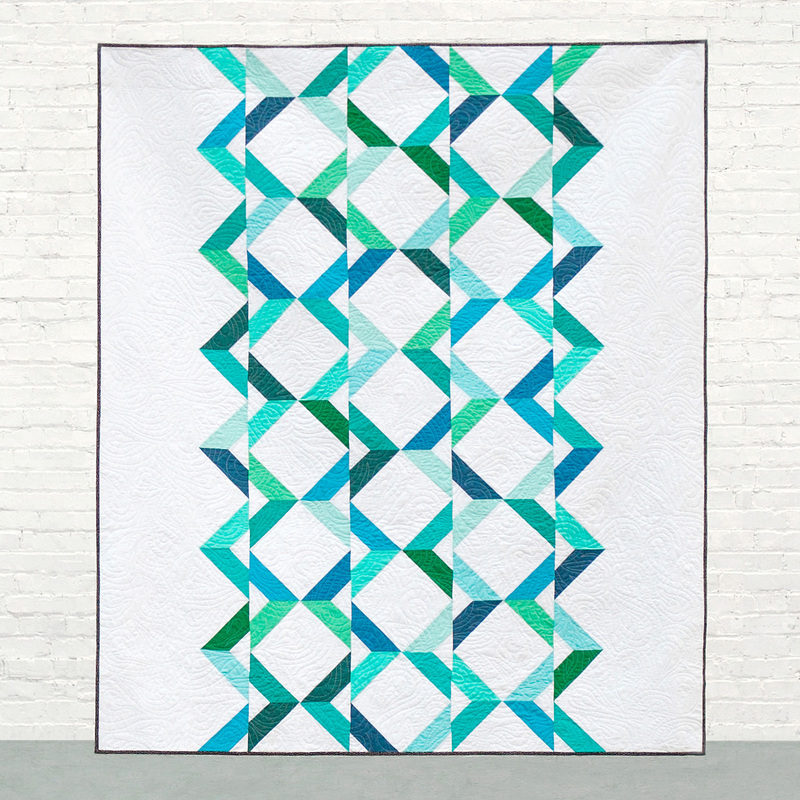 The Wayward Transparency is a free quilt along with monthly directions and plenty of different options for laying quilt top. The Fabric B is a cross-weave of red and yellow (the warps of the fabric are yellow and the wefts are red) giving the fabric an overall orange look. 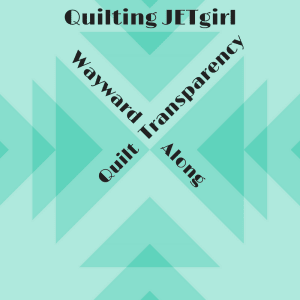 You can find out more information about the Wayward Transparency on the Quilting Jetgirl blog right here. 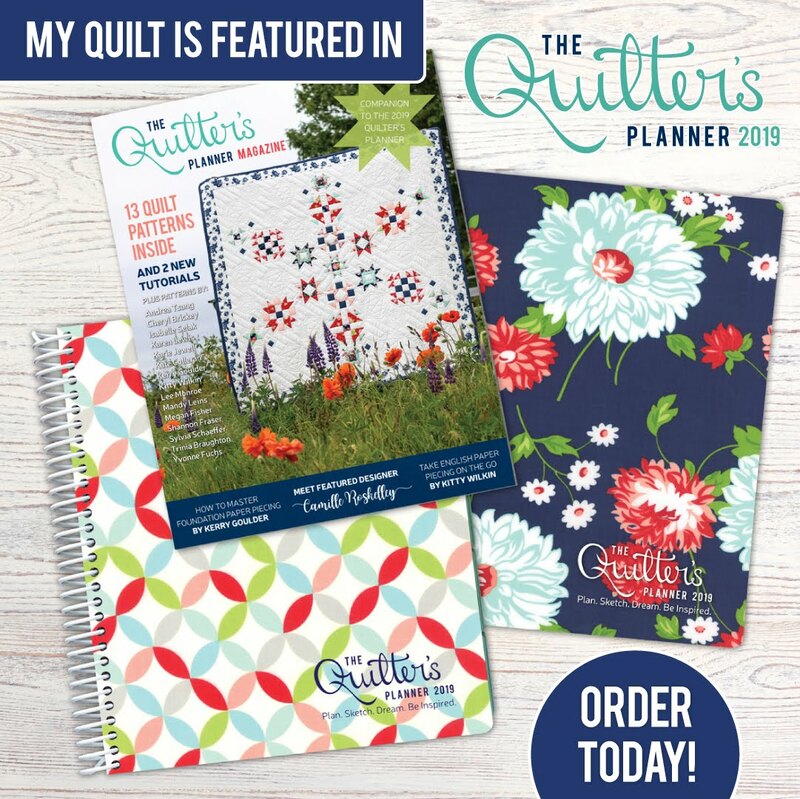 Curated Quilts is a new a printed quarterly journal that is launching their first issue soon and in their news section of the website, I saw a call for submissions for their next issue. The magazine was looking for mini Log Cabin quilts 10"x10" up to 16"x16" using their color palette of 5 colors. I have been working on some quilts and patterns for magazines (to support the Modern Plus Sign Quilts book), so I thought that a mini might be a fun little side project. 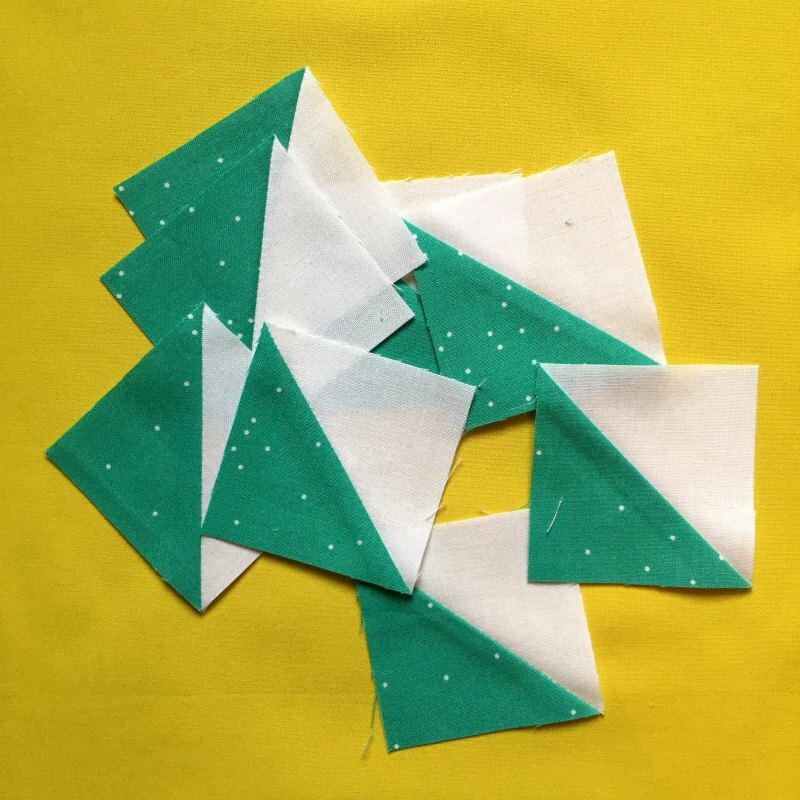 Here is how my mini came to be... After finding solids in my stash that were pretty close to the colors in their color palette, I cut a bunch of ¾" - 1 ¼" wide strips from each color and started piecing them together into random log cabin blocks. Next came the fun part, trying to fit them all together into a cohesive and pleasing arrangement. Due to the size restriction, I decided my blocks were a little on the large size and so when I arranged them, I folded them to get an idea of how to trim them down and fit them together. I used Kona Windsor as the negative space because I love the color (it is this wonderful dark blue with gray in it which is difficult to capture in a picture) and I had a bunch of it. For quilting, I used a diamond cross-hatch design with varying spaced lines. The quilting went super quickly due to the small size of the quilt. I used Aurifil 1246, a medium gray, in 50 wt to quilt with. 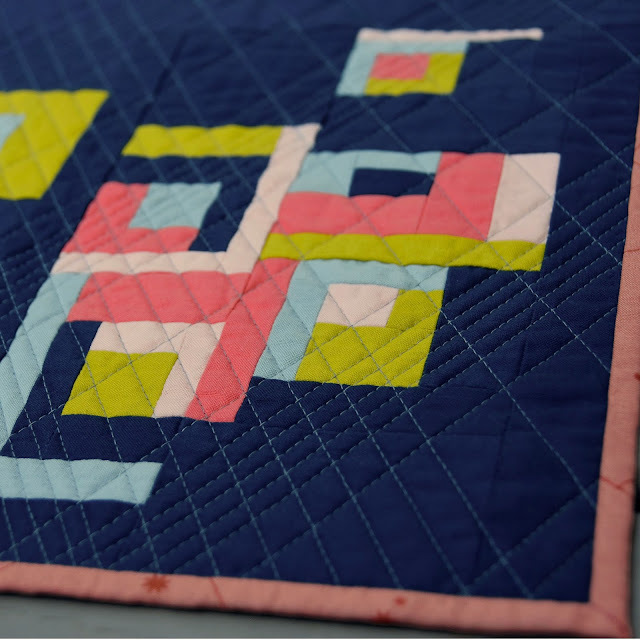 I wanted the quilting to show up both on the lighter blocks and in the darker blue background to pull the blocks and negative space together. 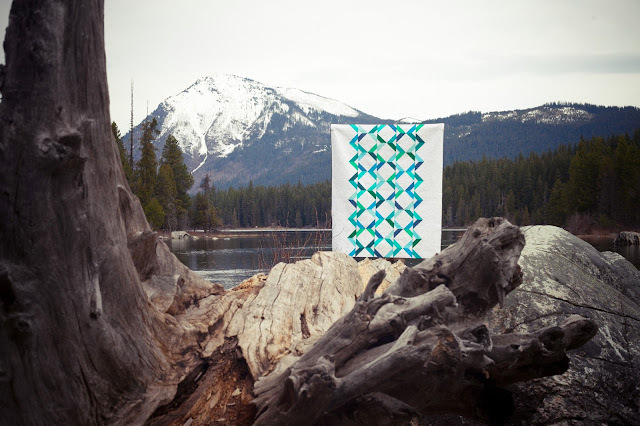 I will be submitting my quilt into the Log Cabin Mini Quilt Call for Entries on Curated Quilts in hopes it makes it into the second issue of Curated Quilts. You should check out all of the other mini's that have already been entered, each is such a great take on the log cabin design and the specified color palette. I am linking up with Finish it up Friday with Crazy Mom Quilts. 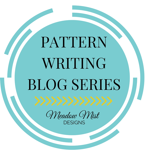 This newsletter will be focused on the pattern/sales side of Meadow Mist Designs (including both patterns and my upcoming book Modern Plus Sign Quilts) and will be separate from than the blog content posted here. 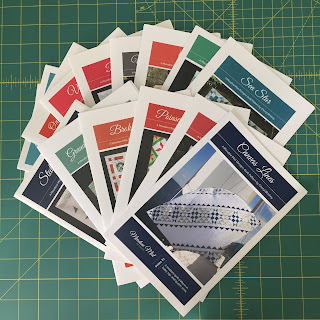 The newsletter will not contain mystery quilt instructions (or other blog content) and does not replace (but builds on and enhances) my blog content delivered via Bloglovin, e-mail, Feedly, or your other favorite way of following the blog. You can use the form below if you would like to sign up for the new newsletter, thanks! **If the form above is not showing up or working correctly, you can also subscribe by clicking here. I will NEVER sell or giveaway your name and email address to anyone, anywhere. The newsletter e-mails will be managed and sent via MailChimp. 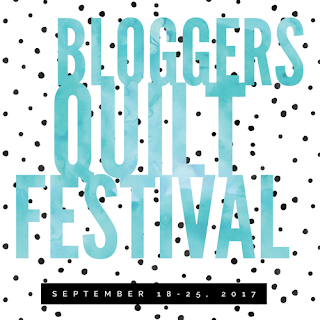 It's that time of the year again...each fall, Amy, who blogs over at Amy's Creative Side, hosts the Blogger's Quilt Festival on her blog. 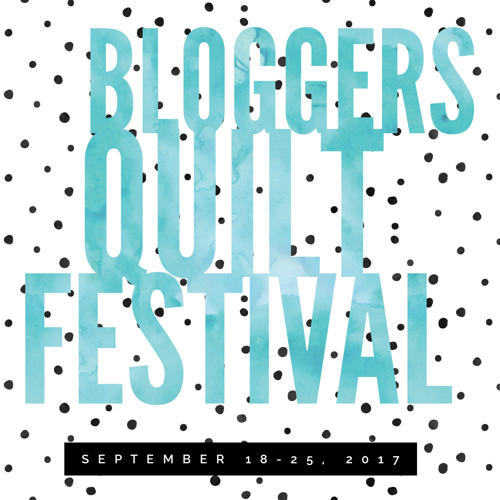 We are allowed to link up two quilts and have the opportunity to visit and be inspired by other blogger's wonderful quilts. My second entry for the Blogger's Quilt Festival is Arrow Point Path, a quilt I made for Quilt Theory. 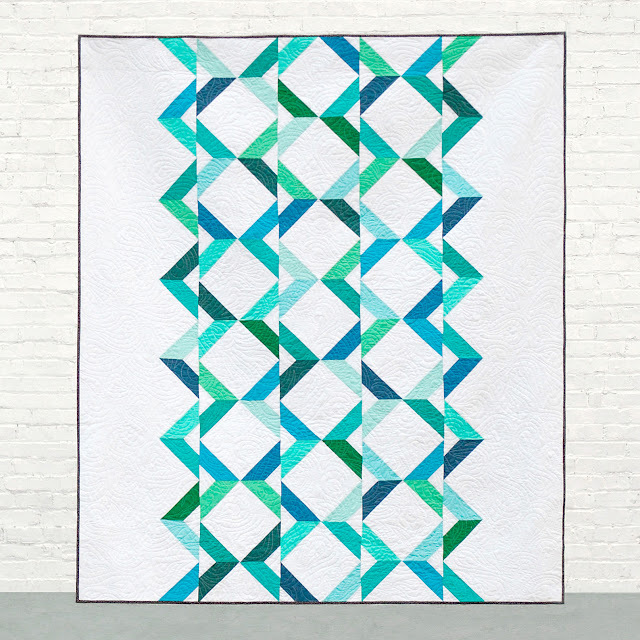 Quilt Theory was formed back in February 2016 from tight-knit group of like-minded quilters collaborating to create simple and modern quilt patterns. All of our patterns are printed on 4"x6" cards (also available on 1 page pdfs) and we will be releasing our third collection in just about a month. I quilted Arrow Point Path in an swirl/paisley type design using 40wt white (color 2024) Aurifil thread. I liked the effect of using the 40wt (versus my usual go to 50wt) because it made the quilting stand out just a bit more to give the quilt some good texture. 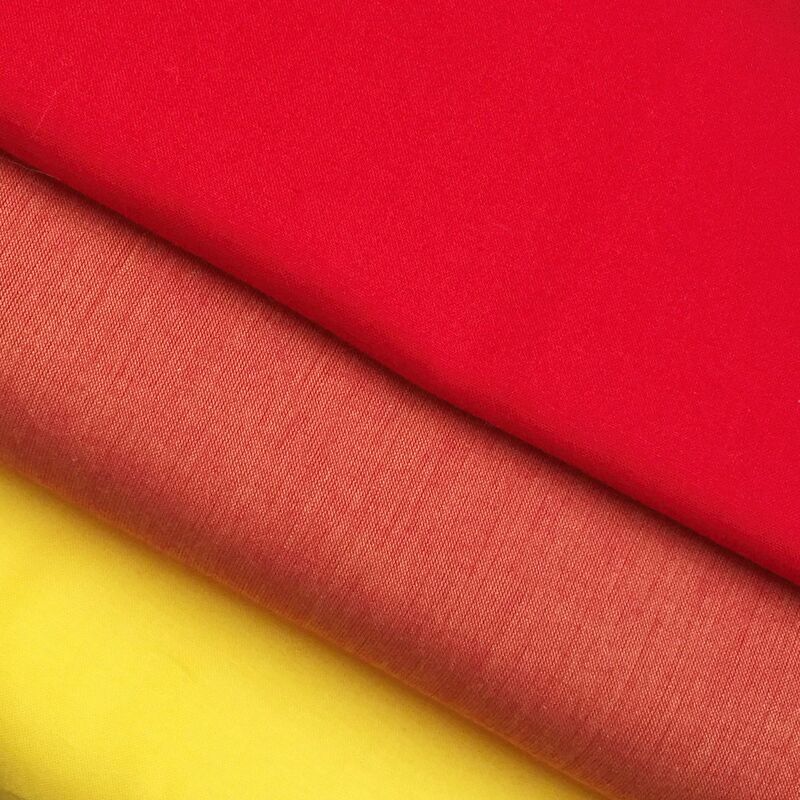 Fabrics: Cotton Couture solids by Michael Miller. 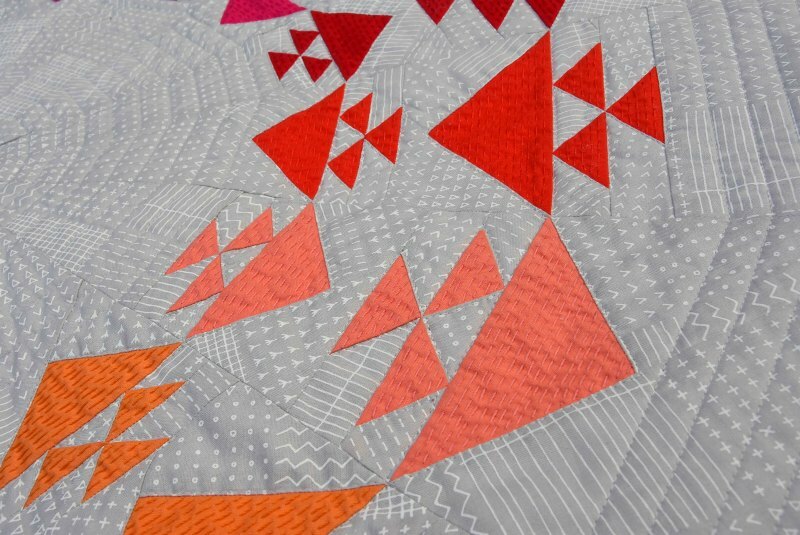 You can find the Arrow Point Path pattern on the Quilt Theory website. My other entry for the Fall 2017 Blogger's Quilt Festival is Taste the Rainbow, you can read about it right here. For those that are new to my blog, please check out the Magnolia Mystery Quilt (my 4th annual mystery quilt), we are just getting started! 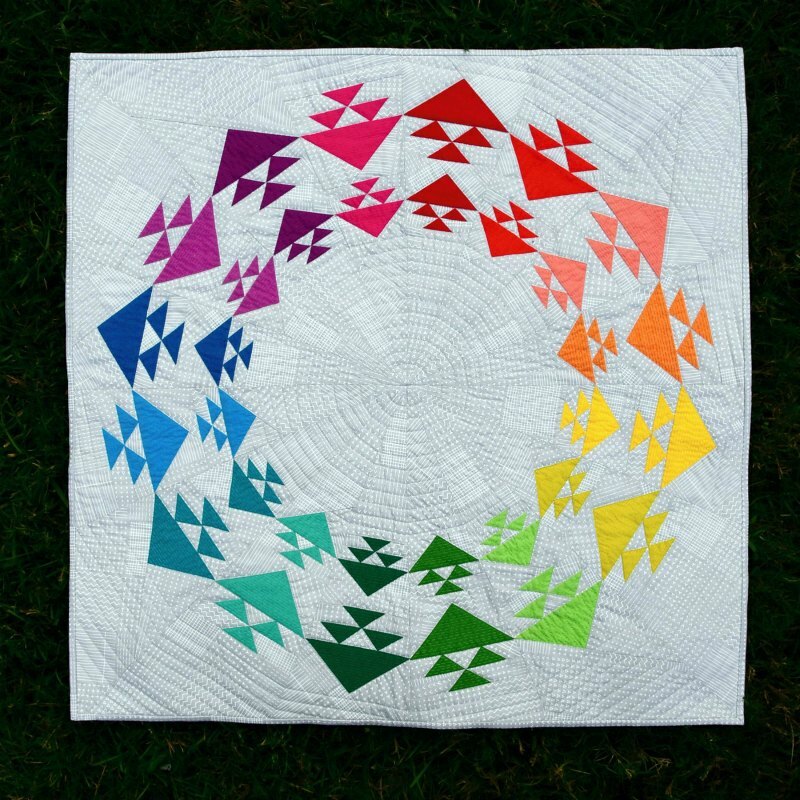 My first entry to the festival is my Taste the Rainbow mini quilt which I designed and made for my local guild's, Greenville Modern Quilt Guild, challenge. 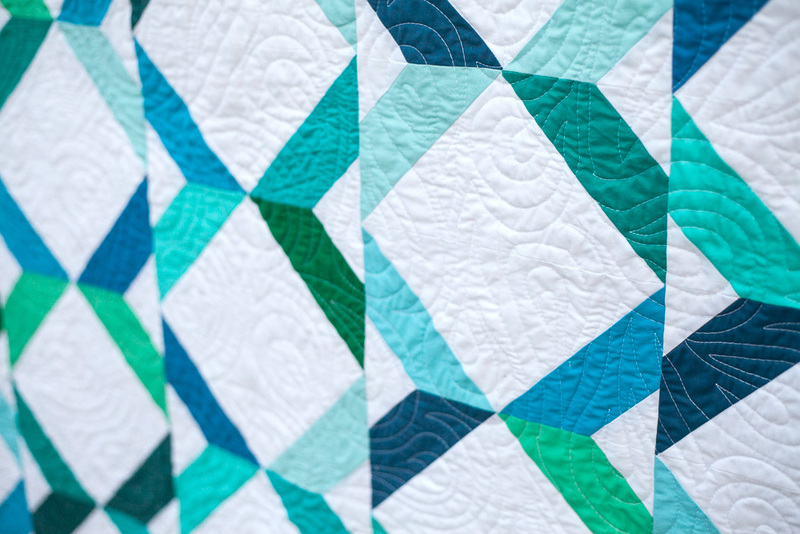 The challenge was to create a mini quilt (less than 36" on all sides) with a modern take on the classic birds in the air block. My mind went towards how to place the blocks without the traditional grid and thought of a circular design. 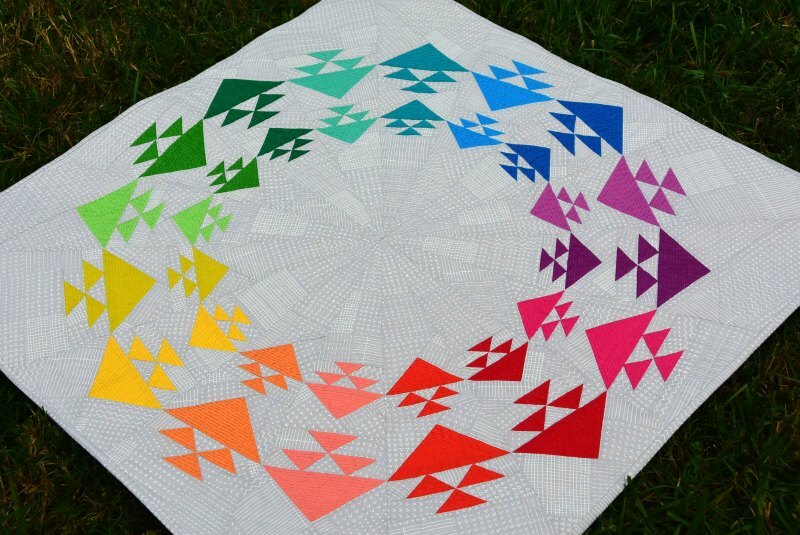 Combining that with a rainbow palette and I had the beginnings of my quilt design. The rainbow fabrics are a mixture of fabric manufacturers with the majority of the fabrics being Robert Kaufman Kona Cottons and Michael Miller Cotton Coutures. The background is a Blueberry Park print from Karen Lewis for Robert Kaufman. 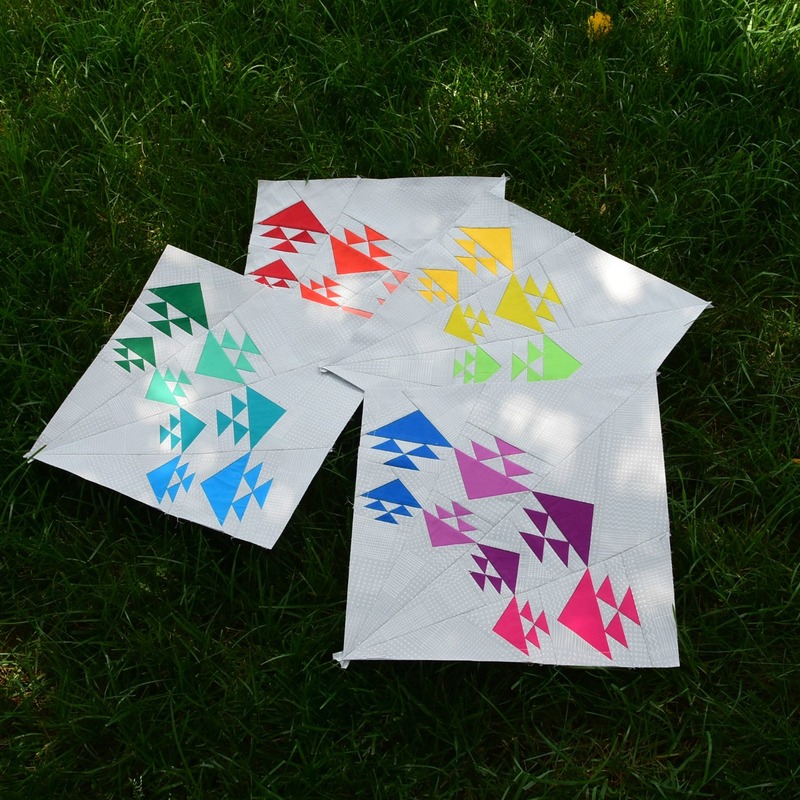 I used Corel Draw to draw out the design and create the paper piecing templates. 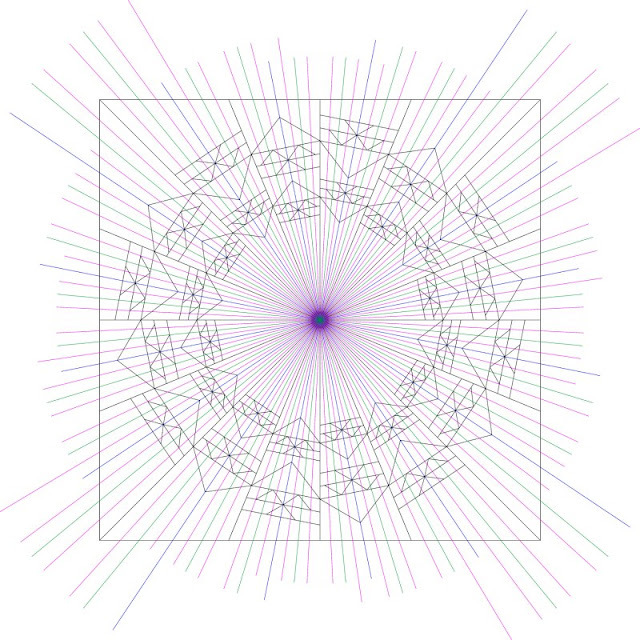 In order to keep everything well aligned and spaced, I added a lot of radial lines, you can see the craziness. The design is paper pieced from 16 "pie slices", with each slice being sewn from 4 paper piecing templates. This was not a quick make, but it was exciting as each colored slice came together. I used my favorite batting, Warm & White by the Warm Company for the quilt. I find Warm & White has a great structure after quilting so it is perfect for wall hangings. I quilted the background by echoing the triangle shapes close to the seam lines and then adding some concentric 16 sided polygons. Next, I add some running stitch hand embroidery (I am calling it embroidery as the stitches only go through the top layer, they are not quilting stitches) 1/8" spacing between the lines using matching Aurifil threads in 28 wt. This also took a long time but gave me a nice hand project for when I was outside with the kids. Note: This is a set of advanced level paper piecing templates, not a full pattern. The instructions do not contain general paper piecing instructions, sizes of fabric pieces to cut, or seam allowances printed on the template sections. Size: 32 1/2" x 32 1/2"
Fabrics: Solids from Kona Cotton by Robert Kaufman and Cotton Couture by Michael Miller. Background gray is from Blueberry Park by Karen Lewis for Robert Kaufman. Quilting Patterns: Triangles used running stitch hand quilting. Background used outlining and concentric octagons. My other entry for the Fall 2017 Blogger's Quilt Festival is Arrow Point Path, you can read about it right here. I am so excited to see all of the half square triangles (HST) for the Magnolia Mystery Quilt popping up in our Facebook group and on social media #MagnoliaMysteryQuilt. We just started piecing the mystery quilt and instructions are monthly so if you want to join in it is not too late! You can find all of the information about the mystery quilt here (including the instructions, fabric requirements, quilt sizes, Facebook group, sneak peek, etc). 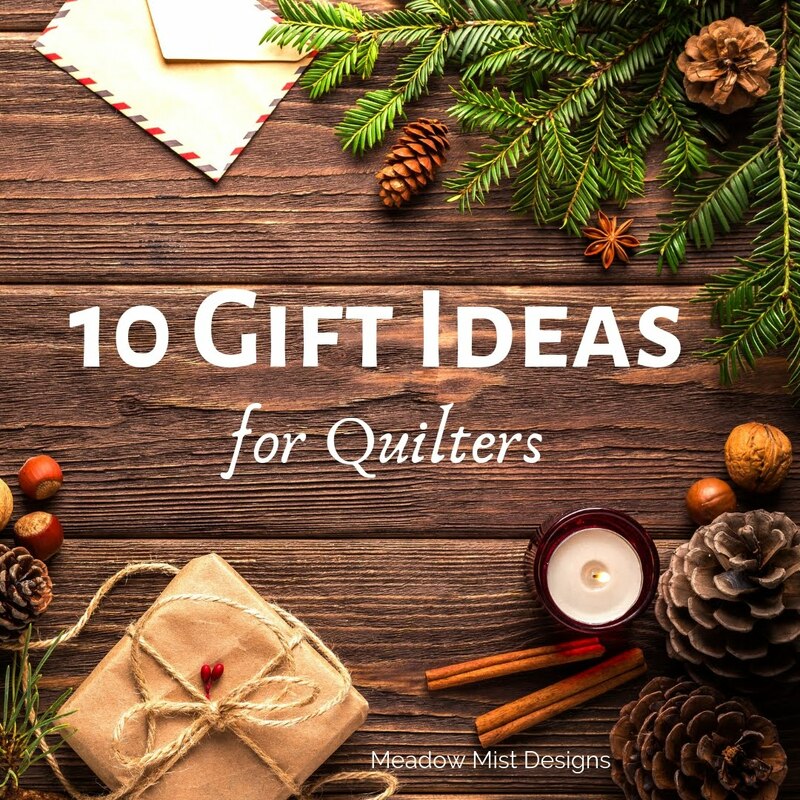 I am linking up with Let's Bee Social at Lorna @ Sew Fresh Quilts and Needle and Thread Thursday at Kelly @My Quilt Infatuation. Modern Plus Sign Quilts ++ the Book!! 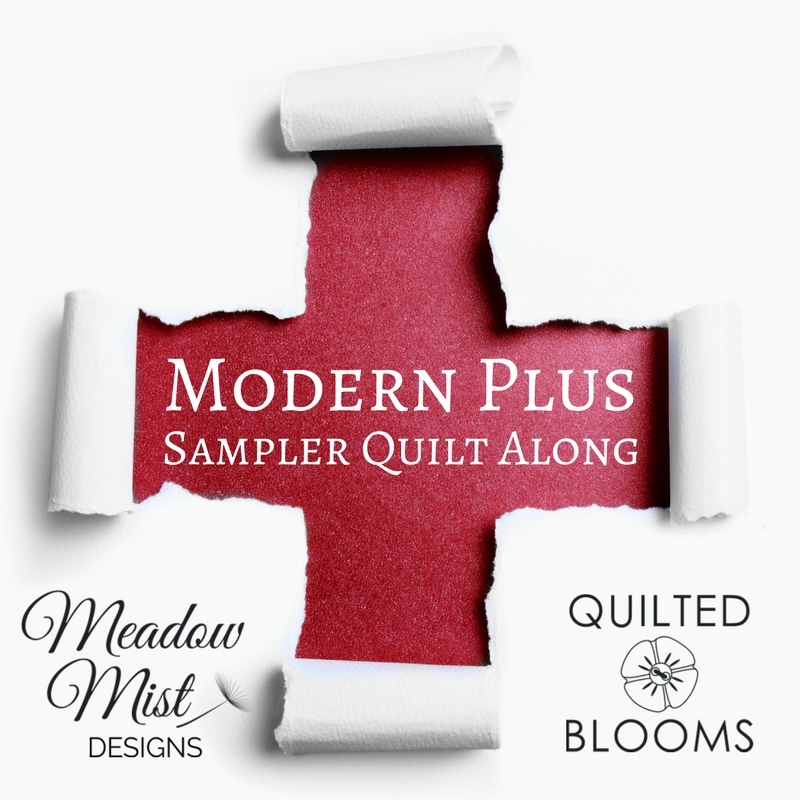 I am so excited to finally be able to share one of my largest and longest ongoing secret-sewing projects....I wrote a book with Paige Alexander (of Quilted Blooms) called Modern Plus Sign Quilts! You all know my love for the plus sign as a design element in a quilt based on how often they show up in my patterns and quilts. I love how classic and universally appealing the design is. We had such fun creating 16 different plus sign quilt patterns, each a twist on the classic and traditional plus sign designs. 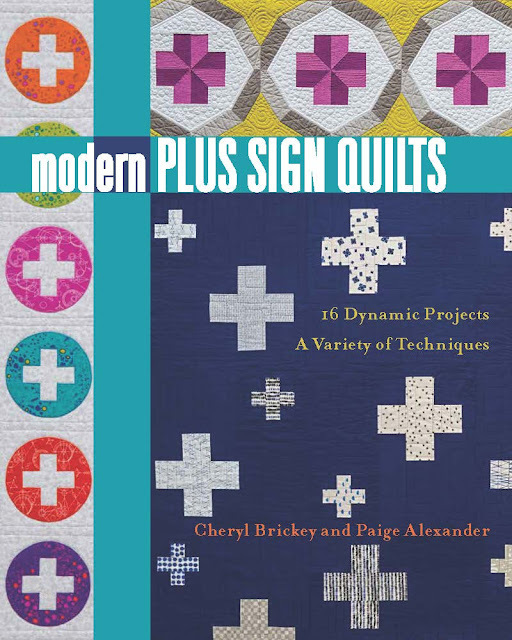 Modern Plus Sign Quilts and is being published by Stash Publications (part of C&T Publications) and is now available for pre-order on Amazon (affiliate link) so I can finally share the cover of the book with you! I think that there are designs for everyone, from baby all the way to queen sizes and from very beginner friendly to more challenging. Most of the quilt patterns are traditionally pieced but there are a couple of foundation paper pieced patterns and applique patterns too. The book is supposed to be published in early February (right before QuiltCon 2018) and I will share more information as soon as I can. Welcome to the September Instructions for the Magnolia Mystery Quilt, we are starting to piece our quilt top! 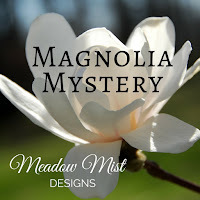 You can find all of the Magnolia Mystery Quilt information and posts can be found here. We are just getting started so please join us! 36 Fabric A squares (3” x 3”) and 36 Fabric D squares (3” x 3”) to make 72 HST units (2 ½” x 2 ½”). 36 Fabric A squares (4” x 4”) and 36 Fabric D squares (4” x 4”) to make 72 HST units (3 ½” x 3 ½”). 1. Place the Fabric A and D squares right sides together. Draw a diagonal line using a removable marking device on the back of the lighter square (shown as the solid line). 2. Sew a ¼” seam on either side of the solid line (shown as the dotted lines). Cut on the solid line and press seams open or toward the darker fabric. 3. Trim each HST unit to 2 ½” x 2 ½” (lap), 3 1/2” x 3 1/2” (queen). 4. Repeat to make a total of 72 HST units. Do you love or loath making half square triangles? Any tips for making them more accurate or quicker to share? I love to oversize my HST and then trim using my Bloc-Loc ruler. I find this makes the most accurate HSTs for me. Many thanks to our generous sponsors! You will seldom see me posting about sales on my blog, but free quilting classes? I need to spread the word! For tomorrow only (Labor Day), Craftsy is giving FREE one-day access to ALL online Craftsy classes. You can binge watch 1,200+ streaming classes - FREE! 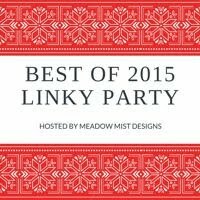 You can hop over to Craftsy right here (affiliate link) to learn some new techniques! Note: This post contains an affiliate link which do provide a small commission from your purchase (this does not affect your purchase price). Which classes are on your watch list? Hi there and welcome to my little corner of blogland. I'm Cheryl and I am an engineer by day writing patent applications for a textile company and a quilter by night. I currently live in South Carolina with my husband, two elementary aged children, cat, and crazy Labrador. 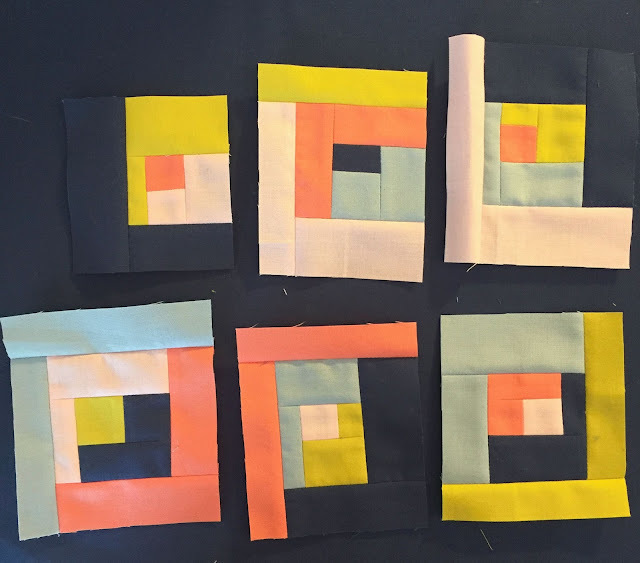 I enjoy all aspects of quilting, especially designing quilt patterns and quilt math. Midnight Mystery Quilt - Fabric Selection.